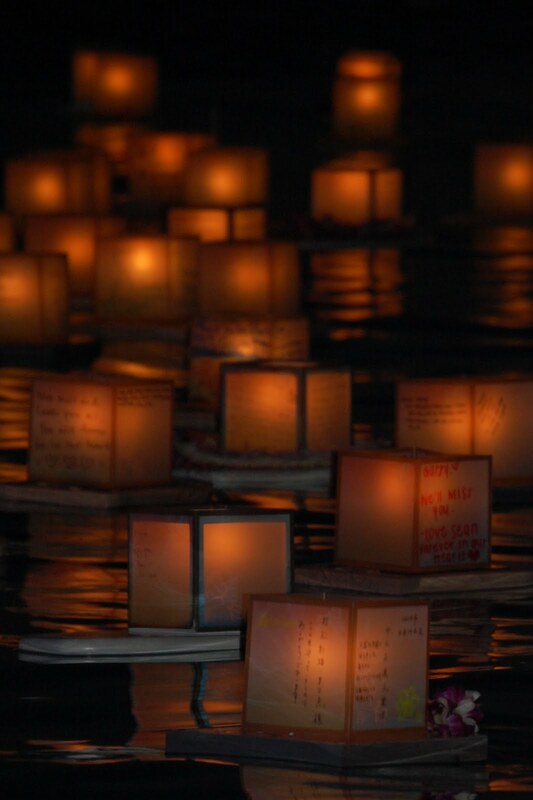 The water glowed with more than 3,000 floating lanterns. I stood knee-deep in the bay watching them go out to sea from Honolulu’s Ala Moana Beach Park, wondering which one amongst the luminaries was mine. 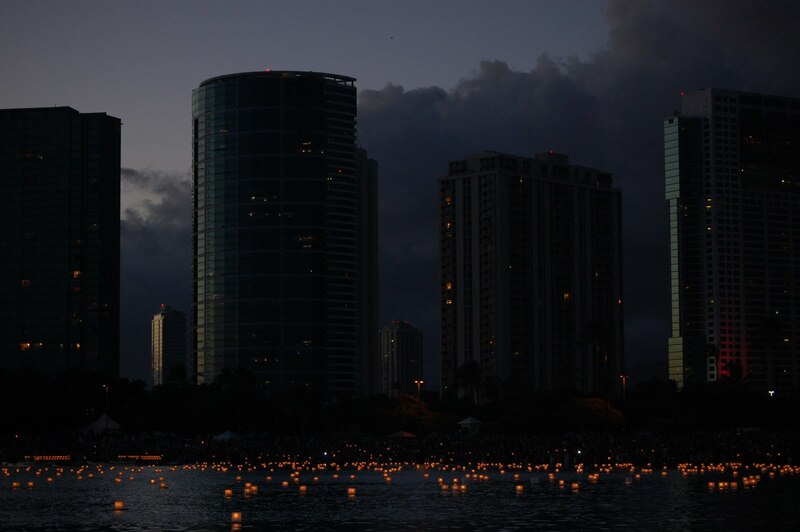 There was no way to know, I could only watch and smile – thinking of everyone who joined me at the 13th Annual Lantern Floating Hawaii ceremony. I lost my mother to a long battle with cancer nearly eleven years ago. Even after so many years, it is still difficult to deal with her departure; the hurt never really goes away, you only learn to live with it. And while it can be painful, part of me is thankful for that hurt – it reminds me just how amazing she was in life. I arrived in Hawaii thinking of my mother and the loss of two other loved ones – my Aunt Beatty and my Godfather Fred; I lost my aunt during my previous trip to Oahu and my Godfather passed away shortly after he took his family to the Islands earlier this year. So, through them, I quickly drew a connection to my mother. It was easy to do, thanks to a lot of strong memories swirling through my head. I arrived at the Lantern Floating Hawaii ceremony late in the afternoon, stunned by the mass of people crowding Ala Moana Beach Park. I knew that – now in its thirteenth year – the ceremony was so popular it had to be relocated to the more spacious park, but I had not anticipated so many people. At least 40,000 people, or so organizers told me, flocked to the park on Memorial Day to cookout, play, swim, and then honor their ancestors at dusk by floating lanterns in their memories. I strolled the beach, squishing sand through my toes, while enjoying a burger and a soda from a nearby food truck. The lantern tent had been pointed out to me, but I was reluctant to go there; I wanted to honor my mother’s memory, but it was difficult to do so in front of so many people. Thinking of her has always been an intensely personal experience and I didn’t know if I wanted to share it with anyone else. I hadn’t really to that point, not even with family, and I wasn’t sure I wanted to start this day. But, as if lead by an unseen hand, I joined the crowd in line. A volunteer would be responsible for placing it in the water and letting it float out to sea. The ceremony began at dusk with Shinnyo Taiko drummers. Several other spectacular performances followed, but none so moving as that by HAPA – Hawaii’s Super Group. By the time their beautiful accoustic set had finished, there was no one in the audience that was not fighting back tears, including myself. When the music concluded, a blessing was offered by Her Holiness Keishu Shinso Ito, Head of the Shinnyo-en Buddhist Order. Silence fell upon the once-rowdy crowd as she spoke. Her tone was sweet and soft, as she offered prayers and blessings for loved ones everywhere who have passed on; it was as though she were compassion and understanding personified. Starting out as a trickle, lanterns were placed into the water one-by-one. It soon became a huge wave with most all of the beachgoers in the water at the same time, sending lanterns with fond messages of their loved ones to the ocean. Some people did so while holding the hand of a brother or a sister, hugging a husband or a wife, but many waved goodbye to their luminary by themselves – just as I did to each one, making sure I caught the one marked for my mother. Other, more broad lanterns – blessed for those who have died in war, from disease, or by natural disasters – were brought to a nearby outrigger to be placed on the waves farther out in the bay. They were there to honor those who had no one to do so, those lost and missed, but not forgotten by humanity. 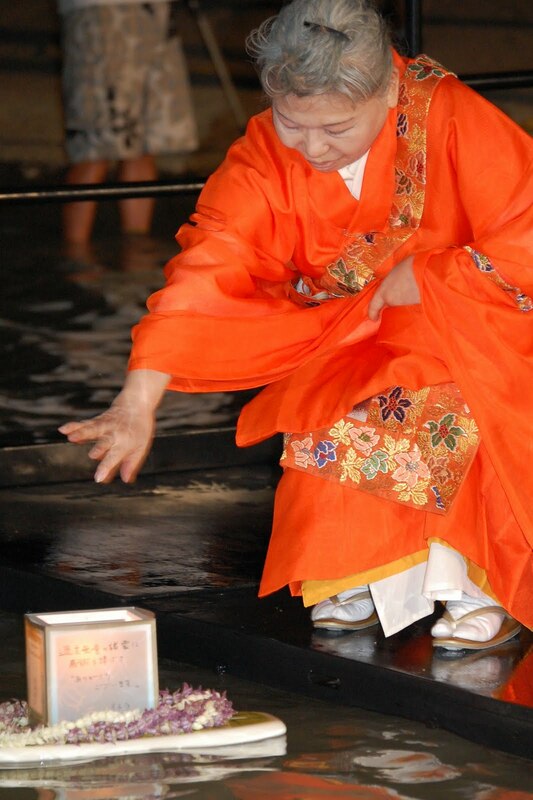 Her Holiness Keishu Shinso Ito, before concluding the ceremony, then placed her o wn lantern in the water from the end of a short dock. Cameras flashed as she waved goodbye with a smile; it was as though she were telling a friend she’d see them again soon. Other thoughts may have crossed her mind as she snapped her own photos, but knowledge was visible in her expression – and maybe she wasn’t too far off the mark. My father once told me that you get to a point in your life where you soon begin to miss more people on the other side than on this one. His time here most certainly isn’t over, nor is mine, but after watching tens of thousands of people wave goodbye to old friends and loved ones, I can now offer a knowing smile of my own. Because, while we most certainly miss our friends and family – my mother, aunt, and Godfather among many others – they never truly leave us so long as we honor their memory, personally or publicly. NOTE: This trip was sponosored by the Hawaii Visitors and Convention Bureau. Thank you for sharing Jason!